REWARD YOUR TRAVELERS AND VISITORS WITH LOCAL AND NATIONAL GIFTS! Promote tourism and travel with an igiftbag targeted to business and tourist visitors. Or, reward your travel guests and customers with gifts to enjoy before and at their destination. We’ve raised the bar for sponsored digital gifts. We’ve included a creative gift option for every promotional and business goal your travel and tourism sponsors may have—whether to raise brand awareness, generate sales or educate customers. Sponsors create gifts for your igiftbag using our automated online tools called Gift Apps. And, they are as simple to use as creating an online party invitation. Our Gift Apps enable sponsors to create beautiful gifts—a discount offer, an expert download, an expo promotion, a giveaway, among others— in a matter of minutes and review and edit them in real-time. Showcase partner attractions, restaurants, shops, tours and arts in one easy to access digital package. With more gifts tools than a conventional promotion, you have more options than ever to promote your travel brand, showcase partners and/or your city and its culture, attractions and merchants with your visitors igiftbag. Combine great deals and discounts with cultural, tour and attraction guide downloads as well as music, arts and recipe downloads (audio, video, PDF, Mp3). Add a local trivia challenge or game with a presenting paid sponsor, or setup a sponsored challenge around finding clues at one or more attractions. Enable your customers to access and use your gifts on-the-go through a locale on their mobile phone or tablet with our personalized “My igiftbag” gift save and plan feature. DEPLOY YEAR-ROUND WITH MONTHLY GIFT UPDATES. You can make your travel and tourism igiftbag available 365 days a year. Update and rotate new gifts each month into your igiftbag and charge partners and local merchants a monthly gift fee to be included, adding a new revenue stream to your marketing mix. DISTRIBUTE ONLINE TO MANY TOUCHPOINTS. Promote your brand or locale by promoting your igiftbag to hundreds to thousands of local venues, events, travel services and hotels to distribute your igiftbag to their customers with a few simple steps. Access to your igiftbag can be added to websites, email newsletters, display ads, among other formats. It’s easy to integrate the igiftbag seamlessly into your sponsorship sales activities. You can setup a sponsorship sales web page in a minutes to promote your igiftbag to all of your sponsors and enable them to learn about the igiftbag’s features and benefits, highlight key information about the sponsorship rates you elect to charge, and provide the online tools for them to instantly create their gift offer. POWERFUL CAMPAIGN AND GIFT MANAGEMENT TOOLS. Create a sales page invitation page in minutes for your partners and sponsors to learn more about creating a gift. Build your igiftbag Send custom Gift Invites to them. Monitor their responses and progress of your partners and sponsors on your RSVP and Manage gifts dashboards. With igiftbag’s state-of-the-art analytics reporting, you can monitor the results of your igiftbag in real-time. Called “the best real-time reporting of a promotion,”* your customized dashboard displays a ranking of your gifts and provides detailed results on click-thrus and click to actions of every item within your igiftbag, among other metrics. 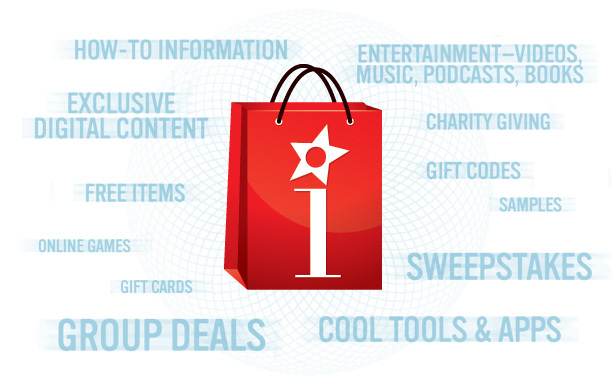 What are the secrets to a successful loyalty & rewards igiftbag? Want to know the answer to these and other gift questions? Contact us to see a demo and learn more about what gifts could be inside your endurance sports igiftbag. THERE’S AN IGIFTBAG FOR EVERYONE. Perfect for: Tourism promotion organizations. Business eventS and venues. Online travel services. Travel agencies. Event and travel planners. Travel media and publishers.